Moto-tyres.ie Vouchers, Discount offers and Free Gifts in April 2019. Redeem a Moto-tyres.ie Voucher from voucher-code.ie and get your benefit at moto-tyres.ie. Free standard delivery at moto-tyres.ie. No code needed, discount applied on site. Never miss again a Moto-tyres.ie voucher or sale offer! Delticom, Europe's leading online tyre retailer, was founded in Hanover in 1999. 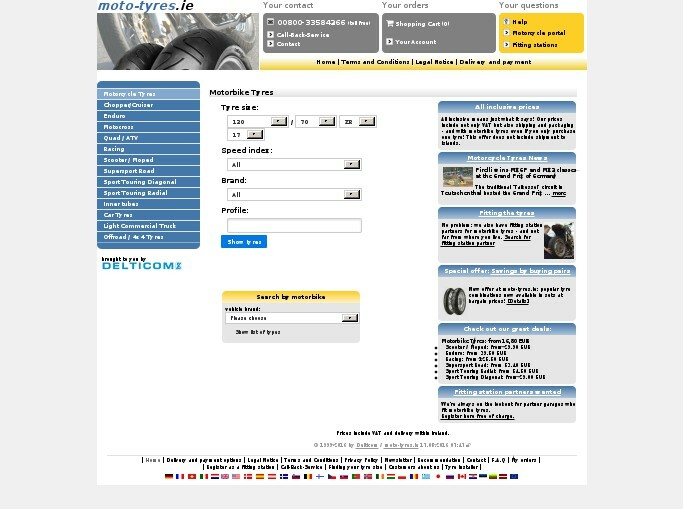 With 124 online shops in 40 countries, the company offers its private and business customers an unequalled assortment of excellently priced car tyres, motorcycle tyres, truck tyres, bus tyres, special tyres, bicycle tyres, rims, complete wheels (pre-mounted tyres on rims), selected replacement car parts and accessories, motor oil and batteries.